Answer me when I call, O God of my right! You gave me room when I was in distress. Be gracious to me, and hear my prayer. How long, you people, shall my honor suffer shame? How long will you love vain words, and seek after lies? But know that the Lord has set apart the faithful for himself; the Lord hears when I call to him. When you are disturbed, do not sin; ponder it on your beds, and be silent. Offer right sacrifices, and put your trust in the Lord. There are many who say, “O that we might see some good! Let the light of your face shine on us, O Lord!” You have put gladness in my heart more than when their grain and wine abound. 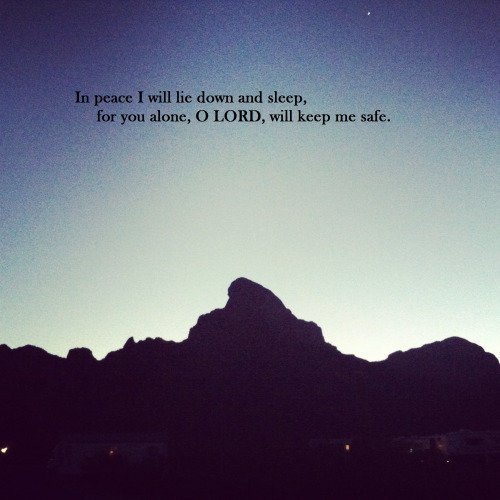 I will both lie down and sleep in peace; for you alone, O Lord, make me lie down in safety. He was resting in the bed when I entered the room. Like many people suffering from a terminal illness, the living room had been reimagined as a bedroom with medical equipment spread throughout the space. The older man’s son stood next to me, trying not to cry while he watched his dad sleeping in the bed. The son gently nudged his father to wake up and introduced me as the young seminary intern. He then left us alone. Rev. Willie Mac Tribble was dying of a brain tumor. He had spent the majority of his life serving as a United Methodist Pastor in the North Georgia Conference. He had pastored 10 different churches during his 40-year career, but now he was stuck in his living room talking to a young seminarian about his life and ministry. Though simple movements sent lightning bolts of pain throughout his body, and he was nearing the end of his life, he claimed that his suffering had been a blessing. Psalm 4 is often overlooked in the life of faithfulness, but it conveys the depth of what it means to rely on the Lord and have the right perspective. 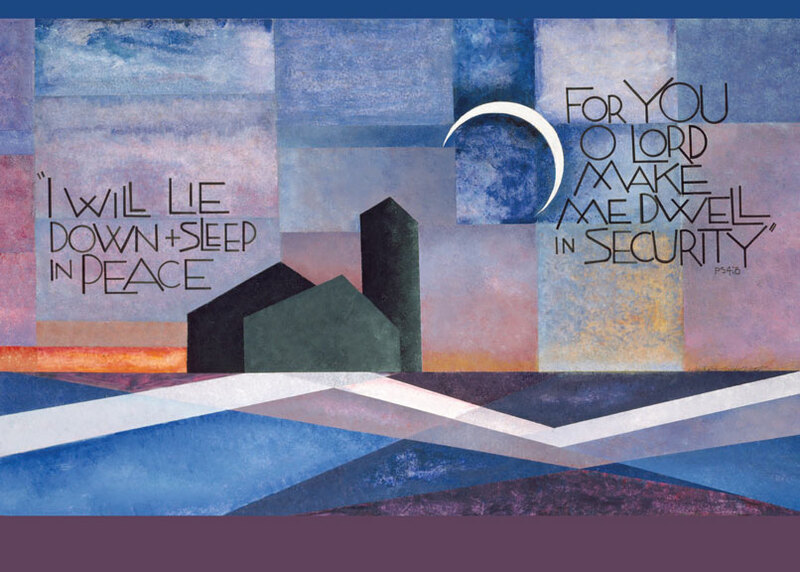 Upon first inspection we might label it as an evening psalm, something to be prayed before our heads hit the pillows: I will both lie down and sleep in peace; for you alone, O Lord, make me lie down in safety. It sounds like a prayer that we hope the leaders of our community would utter up to God recognizing they have endured shame for the betterment of the people. It is selfless, hopeful, and faithful. Yet, this psalm is not just for a particular set of people with a specific set of problems, but it is a psalm for all of us, worthy to be prayed throughout our lives. God, when I start praying, please listen and answer me. I know that you are the Lord of my life, and you are with me in all things, but I need you presence now. In the past you provided for me when I was in need. You placed words on my tongue when I was speaking, you sent the right people into my life when I was lonely, and you provided food from the earth when I was hungry. So Lord, be gracious yet again and listen to me as I pray. How long will all you people fall short of you potential? Why do you continue to love words that puff up, that make you sound better than you are, that inflate your ego and self-perception? How long will you believe all the lies that surround you? Why are you so transfixed by the rumors and drama? Remember this: the Lord has set us apart to be a holy people who pursue holiness. The Lord listens when we call to him. When life is full of disappointment and regret, when you feel like nothing is going your way and the floor is crumbling underneath, when you experience loneliness and fear, do not sin. Instead of venting and taking out your frustrations on other people, ponder your circumstances and be silent. Give up the things that are tearing you down, and put your trust in the Lord. We are at the peak of our faithfulness when we recognize the gladness the Lord has placed in our hearts more than when all the material things of life abounded. We do well to recognize the Lord’s blessing in all things and trust that God is with us. Because it is only with a deep trust and confidence in the Lord that we can sleep in peace, for the Lord is the one who brings us comfort in our rest. Why are all of us here this morning? I count it as nothing short of a miracle that God continues to gather people together every week for worship. But the fact that people choose to spend their time doing something like this will always surprise me. With all the competing narratives in our world, we decided to come here to participate in an ancient practice of letting the Lord reorient our lives. Why are we here? Perhaps the best answer to that question is this: we want to hear something true. All of us are constantly bombarded by the facts of the life, and the subsequent denial of those facts. We wake up feeling sore and then we watch a commercial about a cream that can make all of our pain go away. We struggle through relationship after relationship and then we get invited to an online dating service that promises to find us a companion for life. We wrestle with children who neglect to pay attention at home and school, and a friend tells us about the magic pill that will calm our children, and make them into who they are supposed to be. And then we come to church and we hear the truth. We learn about our sinfulness and how we need to be better. But through the church there are no cheap fixes, there’s no pill or simple prayer that can turn everything around. Discovering our sinfulness and seeking holiness requires a lifetime of work. Yet, here we are. I have to believe that even though the life of discipleship is remarkably difficult, we are here because we believe it is worth it. We are here because we hear the words of Psalm 4 and we know that it is speaking something new and truthful into our very lives on this very day. Church, at its best, is the arena of reality checks. Whether we want to admit it or not, this is the time when we face the truth: The unrighteous often flourish, and the faithful are usually ridiculed and ignored. In fact, godliness tends to make suffering inevitable. Psalm 4 speaks to the deep truth of what it means to follow Christ: if we really act like the Christians we claim to be, we will be persecuted for our discipleship. So here is the deep reality check of Psalm 4: True happiness and faithfulness is often found in the least likely of places. We imagine that the wealthy and powerful are joyful but what they have cannot make them happy and sleep in peace. It never ceases to amaze me, but I regularly discover happiness in places I would never imagine: hospitals and funerals. The people who are in the midst of pain and suffering are somehow renewing their own lives. They are the ones who are proving that they can face life’s harshness and still stand fast. There is an inner glow in the heart of a disciple who can show such faith in the midst of something so tragic. Mac’s faith was not grounded in simple and straightforward theological claims, but was instead rekindled by the recognition of how blessed his life really was. It is so sad that it often takes a profound loss or an unwavering diagnosis to make us appreciate what we have, but for Mac it made all the difference. He recognized the true gladness in his heart, even in the midst of suffering, because God’s love was being poured down upon him during the final days of his life. He could only claim his cancer as the best thing to happen, because he understood that death is not the end, and that God will take care of us when we die. This room is full of sinners and maybe that’s exactly why we are here. While the world tells us to forget our mistakes and press forward, the church calls us to look upon our short-comings and repent. While we seek to find fulfillment in relationships and passions, the church challenges us to remember that only the Lord can provide wholeness. While we strive to ignore that annoying co-worker, and push off our children’s problems onto someone else, the church tells us to love one another and take responsibility. This is one of the only places left that actually challenges us with the truth. I stand at the front door every Sunday and I see all the sinners gather for worship. I see the broken relationships, the arguments between friends, the bad blood that continues to boil over, the resentments and frustrations, the prejudices and failures. And we stand and sit, we praise and pray, and then the chief sinner of us all gets to stand at the front and talk about what God is still doing in our lives. My friends, we can’t wait for something bad to happen before we begin to appreciate what we have. If we base our happiness around material success, then we will never feel truly fulfilled. If Psalm 4 is speaking something to us today, it’s to start giving thanks for what we have, and seeking out those whom God has placed in our lives. But if we’re not at that point, then we can at least begin with prayer. Maybe like the psalmist we can commune with the Lord before we go to sleep, or perhaps we can go to God the moment we awake in the morning. 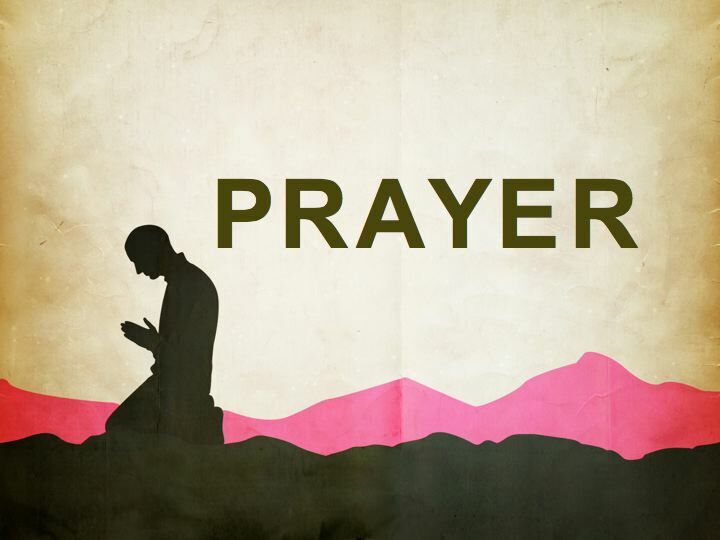 It does not matter how we pray, but that we pray in the first place because prayer leads to trust, a trust in the Lord that even when we die, it will not be the end. Amen. On the first day of the week, when we met to break bread, Paul was holding a discussion with them; since he intended to leave the next day, he continued speaking until midnight. There were many lamps in the room upstairs where we were meeting. A young man named Eutychus, who was sitting in the window, began to sink off into a deep sleep while Paul talked still longer. Overcome by sleep, he fell to the ground three floors below and was picked up dead. But Paul went down, and bending over him took him in his arms, and said, “Do not be alarmed, for his life is in him.” Then Paul went upstairs, and after he had broken bread and eaten, he continued to converse with them until dawn; then he left. Meanwhile they had taken the boy away alive and were not a little comforted. This morning marks the beginning of our three part sermon series on Strange Stories from Scripture. Part of our series was born out of the immense treasure that is begging to be discovered from God’s Word in addition to the fact that it is too easy to fall into a rut with preaching the same and familiar texts over and over. Today we are talking about the fate of a young man who was bored to death (almost). A young man named Eutychus, who was sitting in the window, began to sink off into a deep sleep while Paul talked longer. Overcome by sleep, he fell to the ground three floors below and was picked up dead. When I have the opportunity to attend different church services, a very rare occurrence since becoming a pastor, I usually sit toward the front on the right hand side. I am of the persuasion that sitting toward the front helps the worshipper with their ability to participate fully in the service. Yet, I know that others have very different opinions on where they should sit for worship. When I was in North Carolina, I worshipped for a long time at Duke Memorial United Methodist Church. I, like many of you, sat in nearly the exact same spot every Sunday. I grew accustomed to seeing the same heads in front of me, and the voices surrounding me during the hymns, to the degree that where I sat played a pivotal role in my worship experience. One Sunday morning I was surprised to discover a Duke undergraduate student sitting in my spot. I can vividly recall the wave of emotions I felt seeing someone encroaching on my sanctuary territory, but I eventually gave in and sat down next to the young man. He had all the markings of a polite and proper gentleman: his outfit had been perfectly ironed, not a wrinkle in sight, his hair was parted to the side, and he sat with precise posture. I attempted to introduce myself before the service started by I was interrupted by the beginning notes of the organ prelude. While our pastor weaved through the beauties of scripture, this young man was doing everything he could think of to stay awake: he scratched his eyes, stretched his back, and even slapped his own cheek. However, nothing was helping. His head would continue to fall down only to be slingshotted back into position every minute or so. “Hey bud,” I whispered while tapping on his shoulder. He quickly woke up and abruptly turned to stare at me. “If you put your hands like this (hands in the form of prayer) you can rest your head between them on the pew in front of us, you can catch some Zs and everyone will think you’re praying. If you start to snore I’ll nudge you.” With a smile he slapped me on the back and declared, a little too loudly, “thanks Bro!” and promptly fell back asleep. Falling asleep in church can have dire consequences. What happened to Eutychus that night should be a fair warning for us about what happens when we fall asleep. Paul had come into town and would be leaving the next day. This night time gathering was the last and best opportunity for him to share the Word of the Lord with the people. It happened on the first day of the week, Sunday, when the people joined together to break bread. This is the first reference to breaking bread as a community since the day of Pentecost in Acts 2; the budding Christian community has begun to sustain one another through the presence of God as experienced through the bread and the cup. Paul had limited time to discuss the Good News with the church so he continued to speak until midnight. There were many lamps in the room upstairs helping to illuminate the space as Paul conveyed the depth and wonder of God with the people. 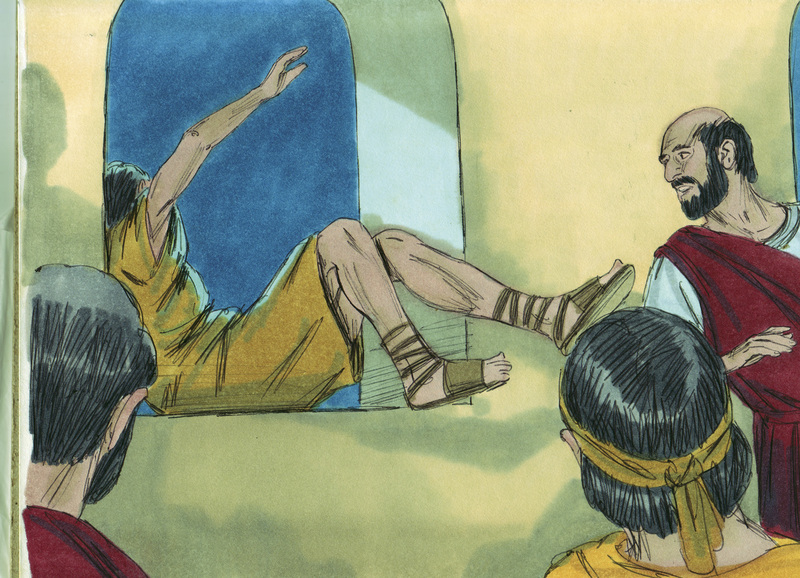 A young man named Eutychus, which means “lucky,” was sitting in the window while Paul preached from the front of the room. Before too long his eyes began to feel heavy, the warmth of the lamps inviting him to rest his eyes, when he sank into a deep sleep as Paul continued to speak. Eutychus fell three stories from the window and was picked up dead. Paul immediately went down, bent over the young man and took him into his arms and said, “Do not be alarmed, for his life is in him.” And then Paul went back to the room upstairs and after breaking bread with his brothers and sisters, he continued to speak with them until dawn. Meanwhile the people had taken the boy away alive and were greatly comforted. Oftentimes when we talk about the church during the time of Acts, and when we talk about our responsibility to be the church for the world, we compartmentalize the message of faith to going out of our comfort zones, opening our doors, and appealing to unbelievers. Yet this story is a sobering reminder that Christians are called to persevere through many trials, requiring the task of worship to comfort weary travelers on the journey of faith. Paul takes the time to gather with God’s people, break bread, proclaim the Word, and encourage them in faith. Preaching is that opportunity to teach and enable disciples to discern between true and false gospels, authentic tradition, and how God’s Word continues to speak living and life-giving words into our lives today. Even if we have the most wonderful and dedicated lives of service, we are weak without the revealed Word of God resonating deep into our souls. Watered-down, inarticulate and unexamined beliefs lead to weak disciples. Do you want to be affirmed in your faith? Listen to words about scripture that leave you patting your back for having done a good job? Do you want to be challenged to live a better life through the proclamation of a sermon? What is it that you hope for from someone like me when I stand in the pulpit. Do you want to be kept awake? Do you want something to think about until next Sunday? Preaching at its finest is, as Paul understood it, that remarkable time when God’s Word becomes incarnate again in our lives. We take the time to sit and listen to the incredible ways that God’s speech speaks something new and fresh in our lives. 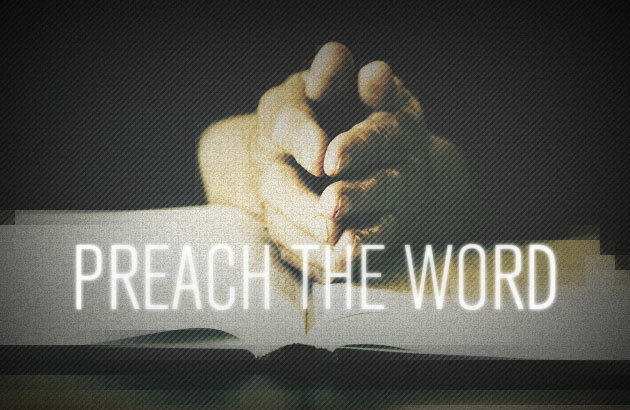 Preaching is about encouragement, challenge, love, hope, faith, recollection, and dedication. On that evening in Troas the preacher for the day went on a bit too long and it resulted in a young man falling to his apparent death from a window. What can I do to keep you awake to the faith that God has in you? 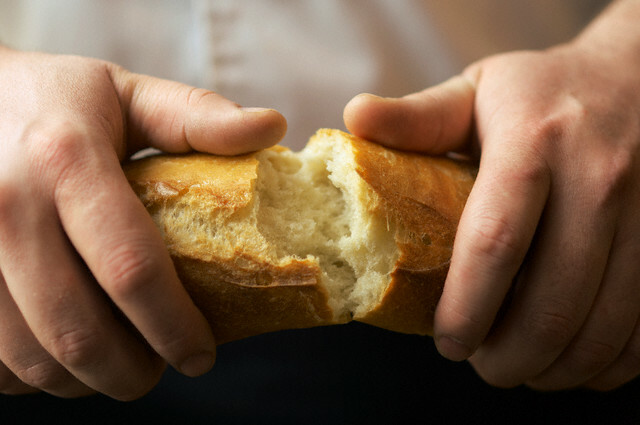 What do you want to discover in the breaking of bread? Paul was with the gathered church to proclaim the Word and break bread. When we gather together on the first Sunday of the month for communion, what do you want to find? Do you want to walk up to the front feeling unworthy of the gift with your head hung low? Are you hopeful for a feeling of complete joy as you dip the bread into the cup to partake in this heavenly meal? Communion is that remarkable time when the divine and human come into contact. We come to the table to feast on Christ’s body and blood remembering what Christ did for us and for his disciples that last incredible evening. We partake of this spiritual food that sustains us for our journeys of faith. We break bread and in so doing we join together with all the saints that came before us and will follow after us. This perhaps is the most important question for us to answer as a worshipping community. Why do we get together to do this week after week? Are we here to check up on old friends, hoping to hear about all the new and wonderful things going on in the community? Do we do church because it is what our parents did and they taught us to do the same thing? When we hear words proclaimed in this place, when we break bread and gather at the table, God is made known to us. Much like the time when Jesus walked on the road to Emmaus with his disciples, they did not know that he was with them. It was only after he interpreted the scriptures and broke bread with them that their eyes were opened to his presence among them. We gather as Christ’s body to proclaim his Word and feast at his table so that God might become known among us. The church today has found itself in a strange place. 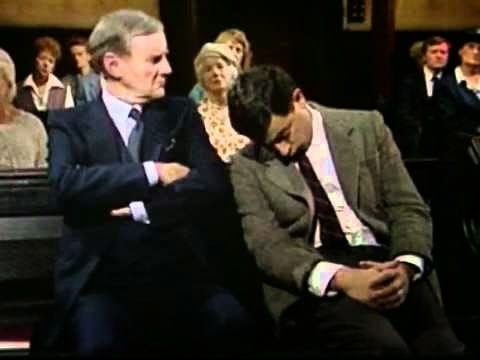 Unlike the past when preachers and pastors had to worry about maintaining perfect, articulate, and sound theology (fearful of sounding heretic), today one of the greatest challenges facing the church is the ethos of boredom. Instead of being caught up in the fear of making someone upset or angry because of something in a sermon, the contemporary church faces the incredible task on fighting against boredom, and in particular, being bored to death, at least spiritually. In the last few weeks I have had a number of Christians from other churches in our community come to meet with me in order to vent their complaints about other pastors. “He doesn’t preach from the Bible!” “She moves too much when she preaches!” “His sermons no longer mean anything to me!” When doing church becomes boring we risk losing people, not just the young, to the temptation of falling asleep to the incredible glories of God. If we come to church expecting it to be more like a funeral, a boring drab of an excuse to remember and anticipate God’s acts in the world, then it will remain as such. But that crazy night so long ago when Paul went on preaching until the late hours of the night, the gathered people might’ve expected their worship to turn into a funeral, yet Paul confidently broke bread, ate, continued to proclaim, and the boy was presented as alive. There is life in our worship! We have encountered the living God who breathes and moves through us. We sing the hymns of our faith with resounding voices to declare the ways of God. We pray the words of our hopes, our joys, and our concerns by lifting them up to the Lord. We are called to feast at the table like all the apostles and disciples before us to be filled with the grace of God. 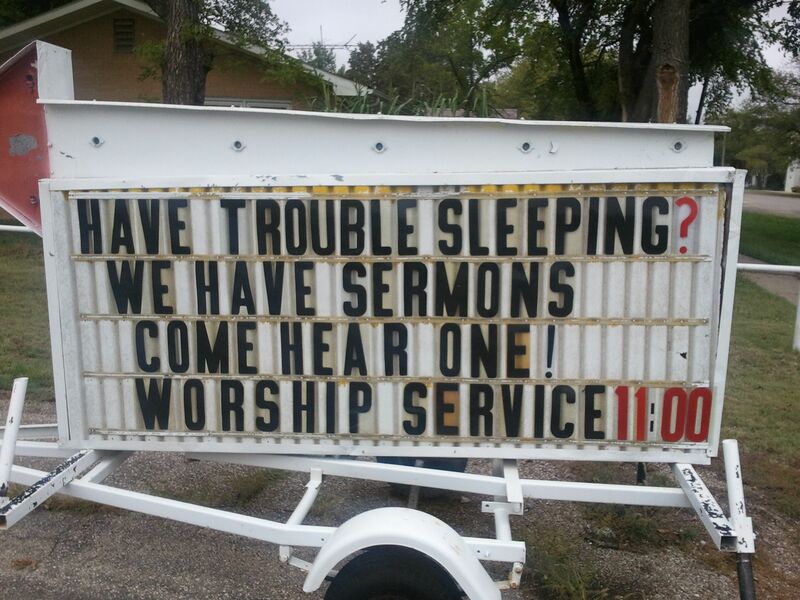 Is church boring you to death, or is it offering you life?